Russia shook Western military expectations last week by using its Caspian Fleet to launch a surprise cruise missile strike against Syrian-based terrorists. The US and its allies were totally caught off guard by this development, and their sloppy response to it proves so. Having not anticipated this scenario whatsoever in advance, they reacted by initiating a feeble and completely predictable psychological war against Russia, alleging without any proof whatsoever that some of the missiles crashed in Iran en route to their destination. Russia proved that it, too, can use cruise missiles to assist in its ongoing military operations, thus confirming that it has achieved the battlefield-tested experience to practice what had hitherto been the exclusive strategic domain of the US military. This puts Russia in the same elite league as the US when it comes to this capability, thus prompting the Pentagon to nervously wonder whether the Kremlin has in fact finally reached a certain level of parity when it comes to conventional force projection. If the US reluctantly (and belatedly) recognizes that this is the case, then it might perhaps adjust its provocative posture towards Russia by taking this ‘new’ military realization into consideration. Military commentator Ilya Kramnik put it best when he said that Russia demonstrated “that [its] navy can carry out strategic missions from deep inside the continent”, meaning that the ‘inland lake’, long thought by the West to be useless from a typical naval perspective, is actually key for projecting military force throughout the Mideast and Central Asian regions. The latter space is especially relevant in the event that the Kremlin ever needs to take immediate and decisive action against ISIL’s Afghanistan-based Russian terrorists, although doing so would require gaining the emergency airspace approval of its Turkmen and Afghan counterparts. Furthermore, the fact that the missiles traveled through Iranian and Iraqi airspace on their way to Syria underlines not only the military cooperation between all parties, but also that a broad Caspian corridor has been created to directly connect them all. This air corridor can be used not only for missile strikes (some of which could realistically hit Iraqi-based terrorists upon Baghdad’s request), but also the transport of Russia air assets into Syria and/or Iraq. Also of note is that the 1,500 kilometers that the Kalibr missiles travelled are long enough to make the Persian Gulf-based Fifth Fleet think twice about whether it’s still safe from potential Russian-based targeting. Former National Security Advisor and influential American-Polish strategist Zbigniew Brzezinski was proven to be the reckless ideologue that Russians have always known him as. Writing for the Financial Times just days before the cruise missile strike, he provocatively suggested that “The Russian naval and air presences in Syria are vulnerable, isolated geographically from their homeland. They could be “disarmed” if they persist in provoking the US.” Lo and behold, Russia publicly humiliated him by demonstrating that his assessment wasn’t true at all, and that Caspian-based naval assets could be used to support the country’s units in Syria. By responding in a manner that had been so unexpected for Brzezinski to conceive of, Russia’s strategists highlighted just how stale the thinking of the US’ geopolitical ‘gray cardinal’ has become. NATO was aghast at what Secretary General Stoltenberg termed “a troubling escalation” after the cruise missile strikes were launched, but what really troubles the military bloc is that Russia has once more shown its willingness to harness all available domains when involved in a conflict. While ground troops are out of the equation, the armaments, equipment, and training that Russia provides to the Syrian Arab Army make for a suitable substitute in this situation, and the Russian Aerospace forces had previously taken the lead in the anti-terrorist struggle. 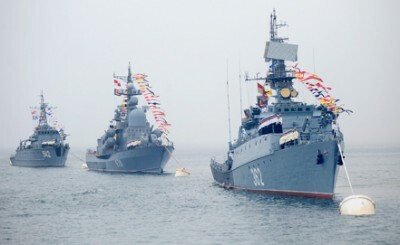 Now, one can add the Russian Navy to the list of the country’s armed forces that are active in the war, and the sea-air interaction between it and its Aerospace counterparts is what really scares NATO the most. The US and its associated information organs had made quite a stink over the past couple of years about how far ‘behind’ Russia supposedly is when compared to the West, especially in the military sphere through its accused deference to ‘hybrid wars’, hence why it should have been all the more surprising to their citizens (and the policy makers that actually believe their own propaganda) that Russia could carry out a 1,500 kilometer-long cruise missile strike with pinpoint precision. Russia’s military success in accurately hitting all far-off targets comes right after a US airstrike in Afghanistan “mistakenly” destroyed a less distantly located hospital operated by the Doctors Without Borders NGO. Put another way, Russian missiles purposefully hit the right terrorist targets from as far away as the distance between Washington DC and Miami, but American gunships can’t hit the Taliban from a distance at most equivalent to the length of Washington DC. This dramatic comparison says all that one needs to know about the inexcusability of American-inflicted casualties across the globe, and questions whether they’re just the result of poorly trained operators or part of a more nefarious “shock-and-awe” strategy of intimidation.